The use of CCTV in the UK, and its impact on human rights and civil liberties, regularly hits the headlines. Concerns are raised both about the number of CCTV cameras in the UK and the lack of regulation regarding their use. The UK’s coalition government have said that they intend to introduce a programme of government which sees greater protection for, and a restoration of, civil liberties in the UK. Amongst the areas they have said that they intend to address is an increase in the regulation of CCTV use. Research conducted in 2002 suggested that there were 4.2 million CCTV cameras in the UK – equating to one CCTV camera for every 14 people. So startling was this statistic that it has been seized upon by critics of CCTV ever since. However, this figure was based on an extrapolation from a survey conducted in one area of London and now seems likely to be unreliable. Comprehensive records of the number of CCTV cameras in the UK are not kept but a 2009 report suggested that the true figure for CCTV cameras in the UK is about 3.2 million. Whilst this represents a significant drop from the earlier estimate it is widely accepted as proof that the UK has more CCTV cameras than any other country in the world. The principal use of CCTV cameras may be by the police and other public authorities to combat crime and antisocial behaviour. However, private businesses – and even individuals – are increasingly turning to CCTV as a means of monitoring and protecting their property. Advances in CCTV technology have resulted in cameras that may have face recognition capabilities, allowing individuals to be picked out of a crowd from a database, or which can monitor for particular types of, suspicious, behaviour. Are CCTV Cameras a Deterrent? 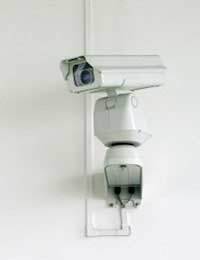 Despite the advances in technology some remain sceptical about the efficacy of CCTV in reducing the level of crime. If cameras are everywhere people may become inured to them and they may lose their deterrent effect. In addition, the cameras must be constantly maintained in order for useful data to be produced by them. Firm evidence that the use of CCTV cameras in the UK has had a positive impact on crime figures has not been forthcoming. Article 8 of the European Convention on Human Rights concerns the right to family and private life. This includes the right to respect for an individual’s home and correspondence. The right contained in Article 8 is known as a qualified right which means that there may be circumstances in which some interference with it is justifiable. This right means that an individual has the right to the level of personal privacy which is compatible with a democratic society, taking into account the equivalent rights and freedoms of others. Any interference with this right by a public authority may be subject to a test of acceptability. The state and public authorities are permitted to interfere with an individual’s Article 8 right to privacy if the interference has an obvious legal justification. Amongst other reasons, this could be because the interference is necessary to protect national security or for the prevention of crime. In addition to having a clear legal justification, the amount of interference with the right must be proportionate to the end result achieved and only go as far as is required to achieve that result. Public authorities, including the police and local councils, must balance the benefits of using CCTV against an individual’s right to privacy. The problem for an individual’s personal privacy is that if a camera is installed by a private company or an individual to monitor their own property there is little legal protection for any individual being observed by it. Nonetheless, there may be issues regarding the use and storage of any images captured by the CCTV camera. The Data Protection Act 1998 governs the use of CCTV equipment and any data produced or stored by it. The Act is likely to apply if a CCTV camera is set up, in public place, to capture everything that passes in front of it. The owner of the CCTV equipment will have to comply with any relevant provisions of the Act. However, a householder who sets up a CCTV camera for purely “domestic purposes” may not have to comply with the Data Protection Act. The only recourse for an individual who feels they are being unreasonably targeted by such a CCTV camera – for example one belonging to an unfriendly neighbour - could be to make a complaint to the police about harassment. Leeds city council and Gough & Kelly CCTV, made five years of my life hell!! Know the manager from college some warned me he was behind the odd stalking situation around leeds and york. They had some strangers, students following me around on some bizar candy camera situation, with bully ambulance and racist cops following me around as well, triggering off their sirens to let me know they were watching me on cctv and following me as well, if i spoke to a man about ducks in a river a siren could be heard, if i texted my related "im going to report gough & kelly cctv" police sirens would be heard in the distance the coincidences have turned into five years of hell, im not doing anything wrong they are! It stems from a police report i made against some transport police being abusive and discriminant. Half the city center of leeds have since been involved in the hate campaign to force me out of leeds, they even did this in stores, hospitals, when I reported this matter to British CCTV Comissionair, tony porter, he posted on twitter " I like to let members of the public know they are being watched" that was his arogant response. The apartment block where I live has security cameras fitted on all doors and externals.The signs say they are used to "protect the building".Photos have appeared of a resident entering the build with a bicycle which is prohibited and photos of the resident (not easily identifiable) have been posted to 'shame' the resident or get another resident to name the party.Is this within the remit of the managers to 'police' slight internal activities which it seems a far stretch to say were endangering the building or residents in any way? I have just come off the phone with the local police after having reported a neighbours camera pointing into my back garden. They have basically said that there is nothing they could do and said that I would have to go down the civil route. This is the second time I have reported this to them and the first time the neighbour was asked to move it but never has done so. As I don't sit on a mountain of cash I doubt that this is a viable option due to the potential cost. Does this mean that I just have to put up with this. Company instaling cameras inside the vans,to watch us,are they right to do so???? Whereabouts are the vans situated? Is this private land? Are there signs to say CCtv is in operation? I'm having problems with a creep I use to study with in Leeds WY. I thought the odd stalking concerns was somebody I use to date but some others told me it was a man I use to study with called Richard Cuff, Gosh & Kelly. They said this manager for these CCTV and some staff called Ian were behind the odd stalking that was coordinated, in York and Leeds. Apparently his father is a police officer, so he has covered all his tracks and had the full back up of the bent police in Leeds. A man miss uses the public CCTV cameras to ask others to distress and harass a woman in public and gets away doing this for 3 years? Its been humiliating and disturbing, through miss using the public CCTV, not to protect me but to distress me. He told me years ago he wanted to be some film producer, never thought he would miss use public CCTV services to ruin and wreck a woman's whole life with some other harassers. Public CCTV isn't for the media this is to protect the public and drivers. This ruined my whole life, some said online they had a 360 degree monitoring campaign to harass me. I was pestered in shops, in the street, at my doctors often these people knew where I was ahead of time. Who ever has been behind this is a bullying coward that enjoys distressing women. If its this man, that explains why the police have harassed me for no valid reason into silence, I was threatened two weeks ago by some police, for no valid reason it really upset my family and has ruined my life further. Leeds is a disturbing place, there are motorbike gangs, bent police and odd people that like to stalk people. Corrupt Cowards! I'm having the same problem with my neighbours cctv ... the CCTV code of practice changed in 2017 and householders are no longer exempt from the DPA if their cctv extends beyond the boundaries of their own property. However I have reported this to the police who won't even come and check his cctv (as they have no powers to do so) and the so-called experts in the police force are still citing outdated guidance on 'domestic use' of cctv. I have also reported my neighbour to the ICO but I don't know how long it'll be before they look into it and in the meantime myself and my two children are under 24 hr surveillance on our own property!! You can ask your local police force if they will pop round and check the siting of the cameras. My neighbour in the block of flats I live in put a brick through my window and following this had the nerve to I stall CCTV around the block which is s social housing property. On of his cameras he put facing down into my garden my social landlord says there's nothing they can do? What rights do I have, this camera observes me going about my business, I feel very venerable. You can check with the Information Commissioner's office to see whether your neighbour has a licence if he is capturing CCTV footage beyone his own property boundaries. The police may also be able to come and check the siting of the cameras and ask the neighbour to remove them if they are infringing your privacy. I live in apartment building and there are cctv everywhere the elevators ,the pool, exersize area I don't want to be recorded. What are my rights. As long as you're aware of the CCTV and it's only in communal areas then there's not a great deal you can do about. It will have been installed for safety and security purposes. CCTV should not be in changing rooms or toilets. I live in apartment building and there are cctv everywhere theelevators ,the pool, exersize areaI don't want to be recorded. What are my rights. My brother is considering carrying a mini camera around at home to protect from domestic abuse by his wife. Is this legal? Arriva Yorkshire have just upgraded some on their buses and they are now displaying the on board CCTV via a large screen on the upper deck. The driver informed me they are rolling this particular upgrade out to all Arriva buses. Is this not a privacy issue? Probably not because you can the see what's going on around you anyway. I was informed by my local pub landlord that he is recording conversations on his CCTV system. Is this legal? I am a private hire driver. My local authority has deemed that we all install CCTV. To their specification. They must record front and rear, cannot be turned off by the driver and be connected to the vehicles electronics. My ph vehicle is also my private vehicle, so I think my personal privacy is being infringed. Check with your local council about the rules for this, or how they will work. It maybe that the cameras only operate when your fare calculator is switched on?? I am a private hire driver.My local authority has deemed that we all install CCTV.To their specification.They must record front and rear, cannot be turned off by the driver and be connected to the vehicles electronics.My ph vehicle is also my private vehicle, so I think my personal privacy is being infringed. I live at home with my two younger sisters and my mother who works long hours, therefore she isn't always home and neither am I. My neighbour lives on his own and has cameras on the front and back of his house which light up as you walk past. He also has a dog barking effect to any movement at the front of the house and a camera on his car. I am beginning to feel intimidated by the fact he knows when we are in or out of the house all the time. I understand he may feel more secure with the cameras but considering we do not live in an exactly well off area it is worrying. Is their cause for concern? It's probably not a cause for concern, but if you feel the neighbour's camera is capturing your everyday movements, you should mention it to your local police or police community support officer. They do have powers to ask to look at the cameras and their siting and can request that they are re-positioned. A work colleague is about to be disciplined following a customer complaint. The customer had a dash cam running in his car while the car was in a staff only area (workshop) the colleague was picked up swearing by the dash cam and the customer has lodged a formal complaint leading to disciplinary action. Is the recording of the colleague without their knowledge or permission illegal? This depends on the location. Why was a customer in a staff only area? I have been going to a local supermarket in my area ever since I was a child. They have only recently started scrutinising me and sending the Security guard to follow me around the store. I often see him talking in his walkie-talkie about my whereabouts like I'm some sort of suspected criminal. I have no doubt that they record me and ensure that all CCTV footage of me is being monitored. Someone please tell me what I should do because I know that I have done nothing wrong, and I would stop going there but I can't because the only make up products that I can use are from that store. Help please!!! When I made civil complaint a year ago on the discontent of security staff of a department store in Korea, I am confident they revenged me by posting my CCTV face recognition nationwide. When I requested confirmation and help to some local police stations, they told me “it’s nonsense. Such thing could not happen” and some told me “we cannot help you because you are not in an urgent situation.” Police station said to me that I had to bring evidences to file my case. They linked information to integrated control center to track me and to show unpleasant behavior and expression to me. After a year of anger and frustration, I went to Japan for leisure and business purpose. They seem to deliver my information to them. And, I am sure that they put my face recognition to Australia and Singapore when I went to Australia via Singapore. For that reason, I ask your help. When I visit you, I am sure they will spread out my information there too. Could you give me evidence of distribution of my information for report purpose?